The FIABCI Prix d’Excellence recognizes the project that best embodies excellence in all the real estate disciplines involved in its creation. It illustrates concretely the FIABCI ideal of ‘providing society with the optimal solution to its property needs’ and even mature projects are eligible. The Prix d’Excellence is much more than just a beauty contest. It represents projects that are a cut above the rest! Presented here are the Singapore winners of the 2014 FIABCI Prix d’Excellence. 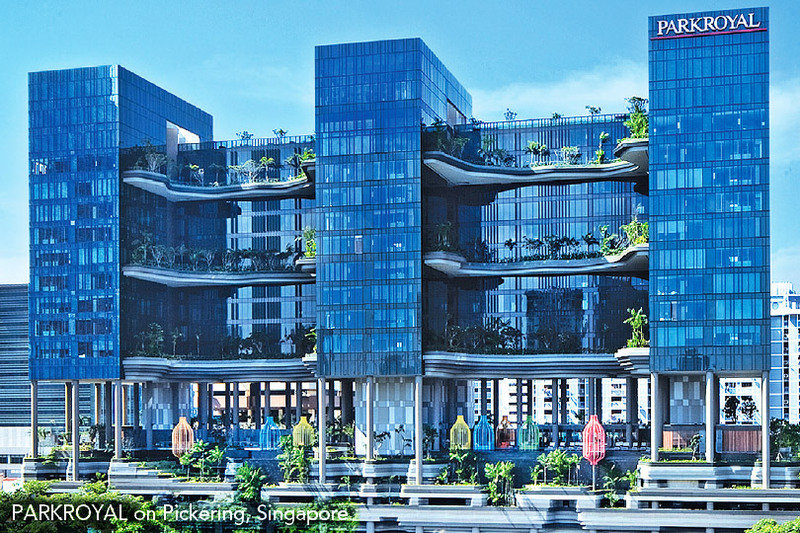 PARKROYAL on Pickering is located in the Central Area of Singapore, at Upper Pickering Street. It is at an important confluence point between the Singapore River, Clarke Quay, Chinatown and the Central Business District (CBD). The development is located within walking distance from Clarke Quay and Chinatown MRT stations as well as the Raffles Place MRT station in the CBD. Its architectural design is one that responds appropriately to its unique site context of being adjacent to a green lung within the city centre. It is a lush retreat right in the heart of the city that you cannot get from any other high-rise business hotel. Over 15,000m2 of elevated sky gardens, water features, planted terraces and green walls were designed, which make up 215% of its site area. The design adapted the idea of our sprawling garden city onto the high-rise building typology with the same sense of relief and delight as one would get from a park on the ground. Extensive landscaping is introduced, which allows alternative approaches to be taken without compromising the comfort and amenity of end-users. Guestroom corridors, lobbies and washrooms were designed as attractive garden spaces, naturally ventilated, shaded by tropical trees and flanked by water features. In addition, the hotel is managed by the Pan Pacific Hotels Group, a subsidiary of UOL Group Limited, under its acclaimed PARKROYAL brand. With experience in managing over 30 hotels, resorts and service suites with over 10,000 rooms worldwide, a high level of service standards is rendered, enhancing the overall experience for the guest. 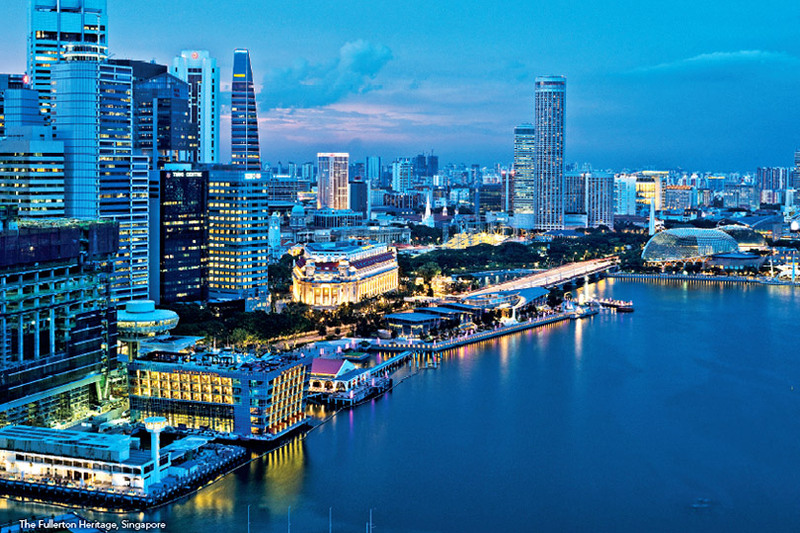 These factors combined with its proximity to the Central Business District and popular tourist enclaves like Clark Quay and Chinatown, were instrumental to the development's success. Singapore's leading developer, City Developments Limited (CDL) is honoured to present One Shenton – an architectural gem that gleams as the jewel in the crown of Singapore's new downtown. Multiple award-winning world-renowned architect Carlos Ott was commissioned to create a stunning design for One Shenton which comprises 341 luxury apartments and penthouses. 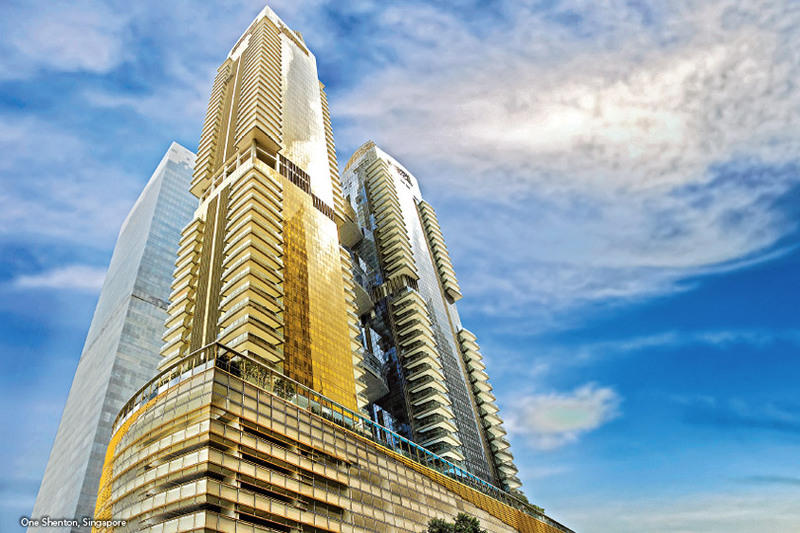 Towering majestically at 50 storeys and 43 storeys high, with its distinctive gold and silver two towers topped with iconic crowns, One Shenton is visually bonded with three sky bridges – the first of its kind in Singapore. The main intent was to create a thoroughly modern and unique sculptural structure with a strong silhouette and a striking façade in silver and gold that reflects the dynamic pulse of city living. The sky bridges accommodate duplex Sky Suites, which come with jet pools, located on 16th to 17th, 26th to 27th and 33rd to 34th floors. These bridges include the Wellness Levels on the 24th and 25th floors which provide a Sky Gym, Spa Garden, Outdoor Fitness Area and a host of facilities. One Shenton, with its city and waterfront views, has an enviable location in the heart of the Central Business District at the edge of Marina Bay, Singapore's premier waterfront destination, close to the Marina Bay Sands Integrated Resort. Also located in this area are the new Business Financial Centre, Gardens by the Bay and an array of leisure, commercial and entertainment facilities. Raffles MRT Station and the upcoming Landmark MRT Station is only a short walk away. With all the attractions nearby, One Shenton is the epitome of a stylish and dynamic city lifestyle. This high profile project was launched for pre-sales (before development) in 2007 and received very good response from buyers. It was completed in 2011. Fronting the historical waterfront, Fullerton Heritage is a landmark site that embraces Singapore's heritage and urban sensibility. It comprises four conserved buildings: The Fullerton Hotel Singapore, Fullerton Waterboat House, Clifford Pier and Customs House, and newly-built Fullerton Bay Hotel, Fullerton Pavilion and One Fullerton. It demonstrates successful integration of new uses within restored buildings, where new and old co-exist, revitalising Marina Bay precinct. One can now enjoy the waterfront freely, enjoy views of new Singapore and reminisce our historical past. Indeed, The Fullerton Heritage has fulfilled the balance of preserving our national monuments, achieving commercial viability and contributing to nation-building. Inspired by a dynamic cosmopolitan lifestyle, the 7-storey W Singapore – Sentosa Cove hotel features 240 guestrooms with stunning marina and golf-course views. 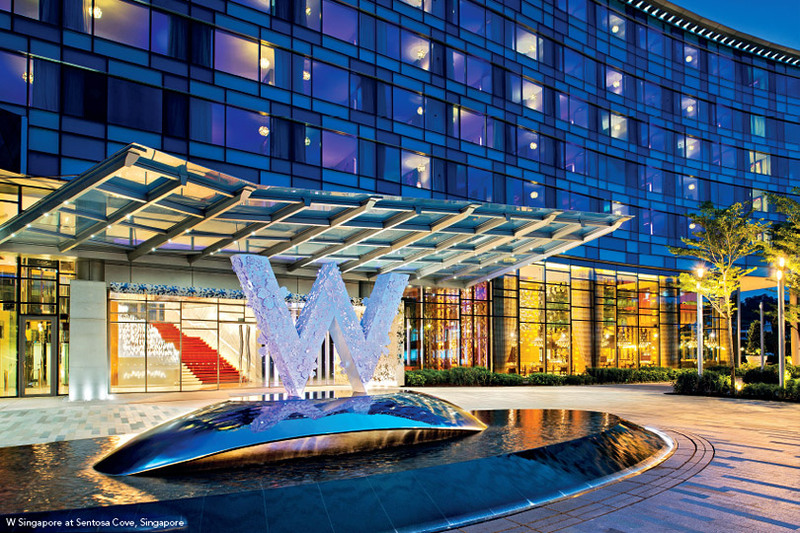 It is part of a winning 3-in-1 concept that offers residents, tourists and locals the opportunity to experience a tropical marina-oriented lifestyle, with Singapore's first W hotel, specialty retail shops and quaint restaurants (Quayside Isle) as well as luxury residences (The Residences at W Singapore – Sentosa Cove). The hotel facilities include a signature restaurant (SKIRT), an all-day dining restaurant (the kitchen table), an indoor bar (WOOBAR), an outdoor pool bar (WET® Bar) and a 500-seat ballroom, amongst others.